Learn a great mediation process. ‘Help Me Communicate’ Video Series. Learn effective communication skills. Every week we will post some tools and tips to help you become a great communicator. Learn how to manage conflict. Learn effective word choice and questioning techniques. go to; facebook.com/effectivecommunicationskills/ for the weekly broadcast at 10 AM mountain time on Wednesdays. What to do to get a promotion. Do you want to move up the ladder at work? Here’s how! We all have two selves at least. Maybe we all have more. LOL. Many say we have a conscious mind and a sub conscious. education online courses said: "Heya i am for the first time here. I came across this board and I find It really useful & it hel.."
Be a Mentor. Millions of people are searching for mentors in your community and online. Pay it forward. Take on one new mentee this year. Maybe lead a mastermind group of 3 or 4 mentees and guide more than one person at once. ValeriePiedE said: "each time i used to read smaller articles or reviews that as well clear their motive, and that is al.."
If you are not 100% sure you are going to keep all of your new year’s resolutions and see them through to completion, don’t make them. Don’t build on unsuccessful habits. Enjoy the 3 gifts of Christmas sharing! Merry Christmas and Enjoy the 3 gifts of Christmas sharing this holiday season with your family and all of your mentors. Godlove said: "Thanks for the gift..."
7 Steps to Make 2017 Great ! From one of my Mentors-Andrew Lock. This 8 step guide to starting a business will give you direction so you can you can start your business with confidence. Register Company Forms said: "Great post for the starters! The points you have shared are really valuable to enhance the confidenc.."
The 7 steps to Find Your Passion and Purpose in Life. So you can love how you live and love what you do…Listen to your inner self. Write down your longings and discontents…. 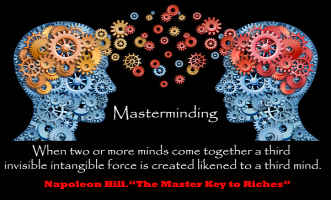 Great men and women around the world use masterminding principles in their daily life — always have. They build incredible networks where they source information to help them make wise decisions. Pooja said: "Thanks for sharing such a valuable post. Masterminding and ofcourse being passionate, sincere and de.."
Tilly said: "Hello, i think that i noticed you visited my weblog thus i came to go back the favor?.I'm trying to.."
When you need to expand your mentor network beyond your community for any reason, the internet is the next best place to look. Having at least four mentors for each aspect of life that is important to you is a very good idea. LeifRGarbacz said: "I seriously love your site.. Great colors & theme. Would you make this excellent site yourself?.." Andre Beluchi said: "The thought of finding a business mentor is one that my father talked to me about finding. I like ho.."
Millions of people around the world and in your community are looking for mentors. Be a mentor to someone new this January; on-line or in your community. “Mentoring Transforms Adversity into Achievement. AYABA NELSON said: "its amazing to be part of this grate minds. thanks for this wonderful information. i shall always be.."
Kissimil said: "That's how it is! I did not know, thank you findamentor.com always good information! I'm here in the.."